Primitive. A concept album about the sound of banging together two bits of flint. Dawn of Man 2001 vs. Eraserhead vs. Cormac McCarthy’s “The Road”. An empty set is an empty box or an empty bag. It's not the same as nothingness. Aesthetically it implies structure without content; absolute potential without manifestation. This works as a template for listening to the record: it sounds like dance music with the guts ripped out; the vengeful ghost of a techno future generated entirely from noise and sine waves. There are no melodic lines on which to hitch a free ride; your attention is required at all times to safeguard against total disorientation. emptyset is a Brutalist structure, a foreign universe born out of a void, becoming sentient and condemned to await demolition. You need not have studied Jung or harbour any particular psycho-geographical leanings to recognize that a drawn out process of smashing a city’s urban heart to pieces might influence its art. With the extensive reconstruction of its city centre, at one point the biggest building site in Europe, Bristol has been a site of dereliction and mass demolition for the last decade. This upheaval, which has seen tonnes of girders, beams and aggregates destroyed, is just another episode in the city's tradition of lo-frequency exploration. Bristol’s ley-lines are as much aural and temporal as they are geographical, running backwards through history. Mass Slavery, Bass culture, Tape hiss in the Lo-Fi Bedsit tradition, Georgian splendour bombed to human smithereens in WWII; All these dehumanized visions subsequently informed everything from the building of an extensive network of underground slave tunnels to the creation of tower block living rooms; lo-frequencies shook the earth and noise filled the air. Bass is the tool, the machine head used to explore cracks, find spaces, open them up and fill them with noise. This is not an analogy; this is happening right now, all over the city. For the wayward musical explorer, living in contemporary Bristol is akin to being lost in a room full of maps, or on a construction site with an incredibly beautiful though constantly shifting view. As a direct consequence, Bristol is the only city that could produce this album. With its dialogues in play between techno, dubstep, drone and avant-garde electronics, the environment of grassroots cultural cooperation serves to destabilize the boundaries between the grammars of individual genres. 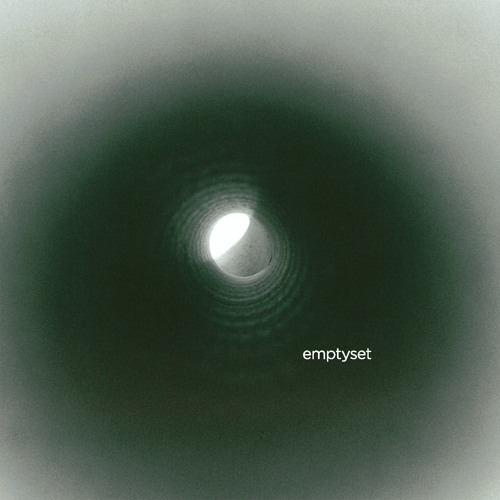 Recorded at Multiverse, birthplace of the labels Tectonic, Kapsize and (of course) Caravan, and artists such as Joker, Pinch, Vex’d, 2562 and Caravan label boss October, emptyset has emerged from a rich lineage of forward thinking experimental music.